Silva, A. Q., Nilin, J., Santaella, S. T. & Herrera, O. Ecotoxicological and physicochemical evaluation of an effluent of a shrimp farm located in Northeastern Brazil. Pan-American Journal of Aquatic Sciences, 12(4): 263-272. Download PDF file (266 Kb). Paul, S., Castiglioni, R., Cervetto, G. & Calliari, D. L. Time variability of prevalent mesozooplankton at Montevideo coast, R�o de la Plata, and its relationship with physico-chemical drivers. Pan-American Journal of Aquatic Sciences, 12(4): 273-281. Download PDF file (509 Kb). Geraldes-Primeiro, L. J. O., Santos-Silva, E. N. & Carvalho, C. M. Natural history of Notodiaptomus amazonicus (Wright, 1935) (Copepoda, Calanoida, Diaptomidae) in a protected urban area lake in Amazonia. 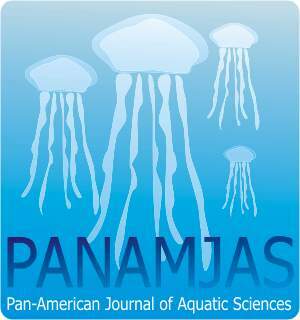 Pan-American Journal of Aquatic Sciences, 12(4): 282-294. Download PDF file (3,933 Kb). Machado, A. S. D., Cardoso, C. M., Sartorio, P. V., Costa, E. F. S., Vignardi, C. P., Hasue, F. M., Viadanna, P. H. O., Santos, D. M., Yasumaru, F. A., Marion, C., Gomes, V. & Ngan, P. Lethal thermal maximum temperature induces behavioral responses and protein expressions (Hsp70 and p53) in juvenile common carp (Cyprinus carpio Linnaeus). Pan-American Journal of Aquatic Sciences, 12(4): 295-309. Download PDF file (1,408 Kb). Pinto, D. S. B., Stringhetta, G. R., Maltez, L. C., Neyr�o, Y. M., Prentice-Hernandez, C., Yunes, J. S., Garcia, L. O. & Figueiredo, M. R. C. Energy and Protein in Diet: Effects on Zootechnical and Biochemical Parameters of Piavu�u Leporinus macrocephalus (Actinopterygii, Anostomidae). Pan-American Journal of Aquatic Sciences, 12(4): 310-320. Download PDF file (166 Kb). Barros, K. V. S., Carneiro, P. B. M., Carvalho, R. M. M. & Rocha-Barreira, C. A. Temporal variation and environmental relationships of an estuarine meadow of Halodule emarginata from the semiarid coast of Brazil. Pan-American Journal of Aquatic Sciences, 12(4): 321-332. Download PDF file (1,082 Kb). Britto, Y. C. T. & Silva-Souza, A. T. Temporal variation of monogenoideans component community in the gills of Oreochromis niloticus (Cichlidae) in fish farming in northern Parana state, Brazil. Pan-American Journal of Aquatic Sciences, 12(4): 333-342. Download PDF file (218 Kb). Ribeiro, J. S., Oliveira, F. C. R. & Ederli, N. B. First report of nematodes parasitizing Clarias gariepinus (Pisces, Siluriformes) in the Americas. Pan-American Journal of Aquatic Sciences, 12(4): 343-349. Download PDF file (564 Kb).